Beycases' latest creation is a wonderful one. The Executive II for the iPad 2 is a leather case with a Smart Cover look and functionality. Those who seek full protection for their iPad 2 will find the Executive II leather case to fit the bill just right. Or maybe not. It bares a hefty price tag of €129.95 (about $192), which isn't so bad when compared against Vaja's prices. The Executive II case acts in the same way as a Smart Cover and can fold into a stand for a typing position as well as a portrait viewing angle. In addition to stand functionality, the Executive II employs the same magnetic features as of the Smart Cover to keep closed while not in use as well as waking and locking the iPad 2 using the front flap. 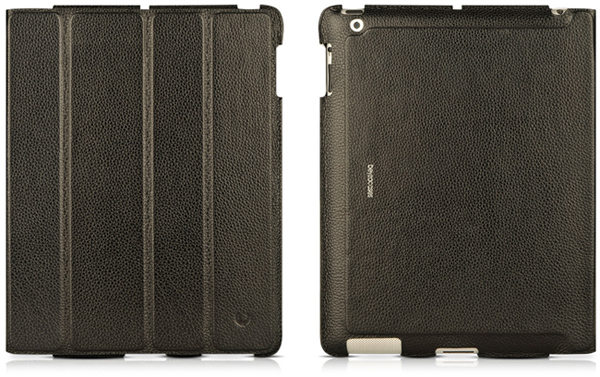 The Executive II leather case for the iPad 2 is now available for pre-order in 4 different leather colors and is expected to ship on May 25.